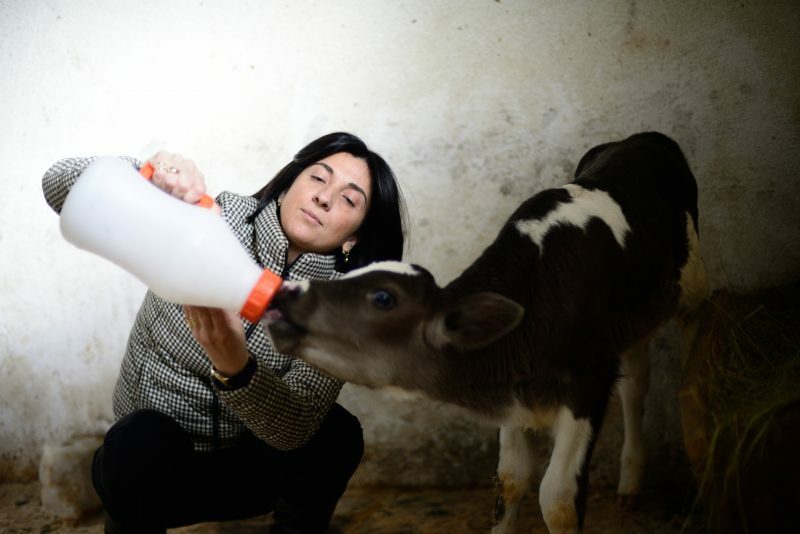 Nino Zambakhidze tends to a calf at her dairy farm. Today, President Trump is launching the Women’s Global Development and Prosperity initiative (W-GDP). We at MCC applaud this bold approach that prioritizes the critical role women play in driving economic success and stability in nations around the world. Strengthening economic opportunities for women is fundamental to MCC achieving its mission to reduce poverty through economic growth; for any nation or economy to reach its potential, the full population must be engaged and empowered. In line with pillar three of the W-GDP initiative, MCC will continue to create opportunities for progress in sectors that have for too long held women back. Through the agency’s investment model, MCC consistently works with partner countries to unlock the economic potential of women and break down financial, legal and cultural barriers that prevent women from fully engaging in their countries’ economies. Below, Nino Zambakhidze shares her story and explains how MCC’s compact with her home country of Georgia transformed her life and is opening doors for women just like her. My name is Nino Zambakhidze. I am a city girl who never lived in a village, but now I own one of the largest farming operations in my country. It all started with my business partner, Beso. One fine morning he went fishing near the village of Akhaltsikhe, about two and a half hours from Tbilisi, the Georgian capital. While there, Beso was charmed by the quaint beauty of the village and purchased two cows. One week later, we got a call from the village farmer who was taking care of them. He explained that he needed help—we needed to buy food and find a pasture where the cows could stay. I went to Akhaltsikhe. It was the first time I saw what a dairy farm looked like and observed the poor conditions in which cheese was made. That night I could not sleep. The thought that my kids were eating that unreliable food produced under such poor conditions was killing me. By the next morning, I had a clear vision that I wanted to have a small farm, but I needed a way to finance the project. First, I tried a bank loan, but I was rejected. Then a friend told me about MCC’s first compact with Georgia which was providing funding for agribusiness development though an organization called Cultivating New Frontiers in Agriculture (CNFA). I wrote a proposal to MCC and CNFA on how to build and transform small cheese production into an industry. To my great surprise and happiness, I was awarded a grant of $125,000. That was the day my life changed. Before the MCC compact, agribusiness was a man’s field and few women entered. Women were struggling to start their own businesses because our lack of collateral and credit history made us appear to be risky borrowers. MCC’s efforts helped fill that gap and break down the barriers preventing women from succeeding. My story shows the incredible impact that U.S. taxpayer dollars can have when invested in developing countries. But even with the financial barrier for women like me removed, it was hard—very hard. I worked and studied simultaneously, had no access to information on how to manage a farm, and it was a challenge to find a good consultant. One thing I enjoyed was talking to elderly villagers near the farm. One of the prominent characters of the village, Uncle Zauri, told me that Akhaltsikhe was once famous for its dairy products and exported nearly 100% of them. After the collapse of the Soviet Union, however, land ownership became fragmented and the rural population got only around one and a half acres of land to produce crops for themselves. Half of the Georgian population became subsistence farmers because they had no other choice. I began thinking about how to help my country, especially the younger generation and women in rural areas, and I decided to create a farmers’ association together with my more business-oriented friends who are farmers. We established the Georgian Farmers’ Association to do just that. We started the association in 2012. It was not easy, but we managed to create a very effective organization which now unites more than 4,000 farmers throughout Georgia. We published a 400-page book called “Pathway to Farming,” created the mobile application “Agronavt” (which houses information on agribusiness), supported a farmers’ distribution company which links farmers to markets, and established the Farmers’ Council, a Parliament-like organization that has 120 members from all 60 municipalities of the country. Thanks to MCC’s second compact with my country, I was able to pilot a dual education model in technical and vocational studies together with the Agricultural University. We developed a guidebook with procedures and inclusive dual-education regulations. It is 2019, and my life has changed dramatically. My business partners and I are commercial farmers and successful entrepreneurs who are paying it forward to the next generation. We now even have a special day, November 20th, when we celebrate Farmer’s Day! I know MCC has programs and projects around the world that have changed many women’s lives for the better, but this is my story. As a woman, entrepreneur, and farmer, and this experience has meant the world to me. I cannot imagine where I would be today without the support of MCC and the United States Government. My story shows the incredible impact that U.S. taxpayer dollars can have when invested in developing countries. I would not be here without it, and there are thousands of Ninos in Georgia and around the world who are now building on the opportunities the U.S. has helped create.